In a nutshell, the differences all pertain to weight, style, and heritage. 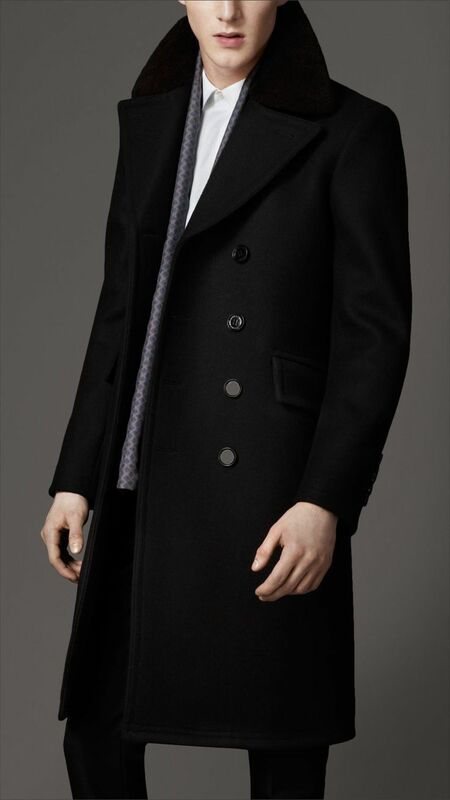 An overcoat is a long coat with sleeves that is worn on top of something else. A topcoat is a lightweight overcoat. A greatcoat is a heavy, bulky overcoat with a military history. When you buy a coat understanding this distinction, especially when buying online, you can save quite a bit in shipping fees as well as disappointment. A good overcoat should be warm, fit you, and make you look great. Fabric. If you plan to wear your overcoat for years to come, make sure you buy a coat that is made of 100% wool and that it weighs at least 4 pounds (for average-sized men). In general, heavier coats last longer because the fabric is more durable. Cashmere coats are nice, soft, and warm but they will show wear on the cuffs, the collar, and moths love them. In addition, they can double the price of a coat for little to no advantage (in terms of warmth or appearance). With the quality of most wool jacket fabrics these days, they are often just as soft as all but the finest cashmere. A nice compromise is a wool cashmere blend. Sleeves. The coat sleeves should completely cover the suit sleeve as well as the shirt cuff, and even reach a little further down. This way, you should not get cold on your wrists when you wear gloves with it. Length. 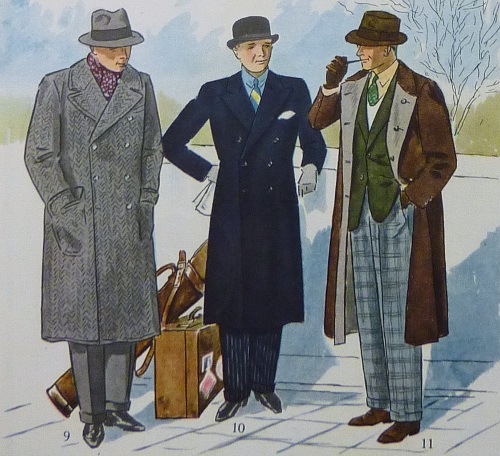 Traditionally, overcoats were rather long-reaching garments, extending almost all the way to the ankles. These full-length coats are often the coat of choice for seasoned gentlemen as they can compliment a wide range of figures…to include those who are a bit rounder in the midsection. Today, most younger men wear their coats knee-length, which is anywhere between the lower part of the knee to slightly above. This only compliments men with trim builds and who wear the coat closer to the body. It’s a convenient option if you find yourself entering and exiting your automobile multiple times a day. If you pick a full-length or knee-length coat is a matter of choice, but bear in mind that the full-length coat may be warmer, and can make you look a little more seasoned than the knee-length coat. Fit. When you buy an overcoat, make sure to wear a shirt and a sportscoat or suit jacket because the coat has to fit on top of it. Some men like a looser fit while younger men often prefer a trimmer fit. However, if you see X-wrinkles when buttoning your overcoat, it is definitely too tight. Style. With regards to style it is once again up to you what you choose. 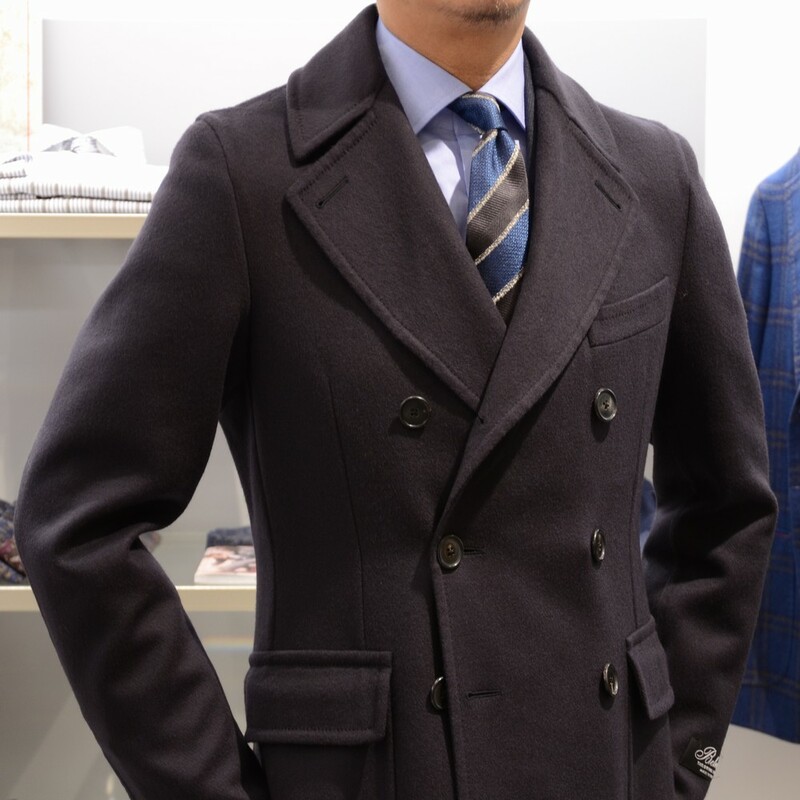 The single-breasted overcoat with notched lapel is a good all-a-rounder whereas the double-breasted peak lapel overcoat is a little more formal and wears warmer when it is cold because you have two layers of fabric over your chest. Construction. High-quality coats have a sewn canvas, whereas less expensive overcoats have a fused canvas. A sewn canvas is definitely more durable and built to last whereas a poorly glued interlining can come loose after a few years, ruining the garment. If money is of no concern to you, go with a fully canvassed overcoat. If not, try to buy fully canvassed suits and go with a glued overcoat. Unlike with a suit, a glued canvas overcoat is acceptable since it is cut looser and you wear it less frequently. 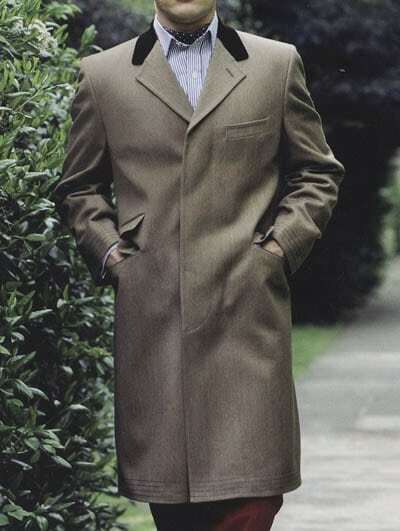 There are a number of classic overcoats which have all made their mark in men’s clothing history. These styles are timeless and will look as good today as they will 20 years from now. Generally, it is about knee-long and in grey or charcoal, it makes for a great business coat. If you go with a velvet collar, you will definitely own a conversation starter. The Covert coat is very similar to the Chesterfield, but it was designed for hunting and the outdoors. Therefore, it had to be tailored from particularly sturdy material – the so-called Covert cloth, named after the covert bushes. It was designed to protect its wearer from mud, bush encounters, and of course the weather. For that reason, it had to be very heavy (29 or 30 ounces a yard), sturdy, and durable. Today, the fabric is not quite as heavy anymore, but it is still a tweed material made to last. It always comes in a brownish-green color because it does not show the dirt very much. The rows of contrast stitching are a hallmark of the Covert coat and lend it a more casual flair. If you want an overcoat that will be your companion for the next two decades, you should consider this one. It should be noted that if you wear your coat primarily for business, this may not be your best choice. 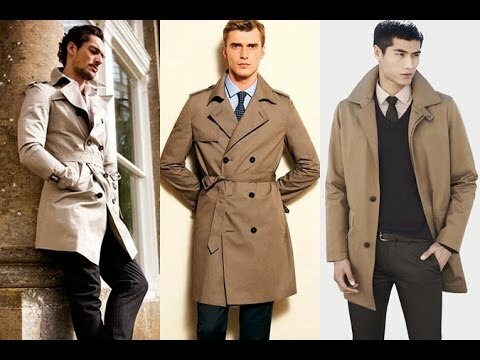 The Trench coat is a timeless classic that was invented in the trenches of WWI and evolved into a raincoat that is second to none. The name Paletot is French and was used to describe a fairly short overcoat that was very fitted, but otherwise could have many features. It could be double-breasted or single-breasted, with pleats or without, and could have pockets or not. Especially in a dark, plain fabric, this coat is very versatile. 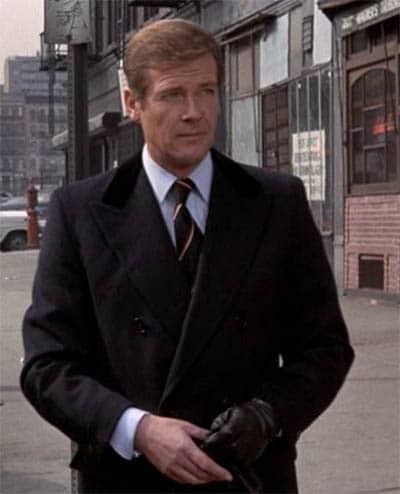 A navy blue or charcoal Paletot overcoat can be worn to the office, with a tuxedo, at funerals, and pretty much anywhere else. So, if you only have money for a single overcoat, you’d be hard-pressed not to buy a Paletot. Left to right: Ulster coat, Guards coat, and a reversible coat. Basically, the Guards Coat is not very different than the Paletot. Its back belt makes it a little fancier and more unique but at the same time it is very difficult to find one off the rack. If you strive to be classic and versatile, yet unique, the Guards Coat is the way to go. Otherwise, stick with the Paletot. An Ulster is an overcoat for a man who is outside a lot and needs a reliable companion. It is an ideal travel coat for the colder months of the year because it is warm, durable, and has big, patch pockets, so nothing can fall out accidentally. In addition, the Donegal tweed structure hides dirt and stains. Overall, the Ulster overcoat is for the rugged man who is not all that much into suits but enjoys rugged, high-quality products. 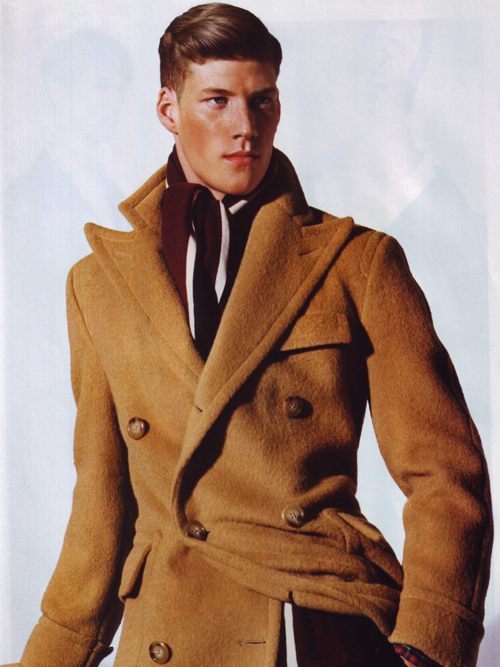 As you can see, the Polo coat is quite similar to an Ulster overcoat, but it is special because of its camel hair fabric and the golden-tan color.